The following cases were discussed on the docket before Judge Steven Beathard recently in the Fayette County Court of Common Pleas. —Scott E. Fisher, 47, of Coal Grove, is charged with forgery and passing bad checks. Fisher, who is being held in the Fayette County Jail, appeared in court Monday and asked to continue the hearing. According to Fisher’s defense attorney, Kathryn Hapner, Fisher’s daughter had died two days prior. Hapner asked the court to consider releasing Fisher from the Fayette County Jail to attend to the personal business. Judge Beathard told Hapner that upon verification of Fisher’s daughter’s death he would consider releasing him. The case hearing was continued. As of Thursday, Fisher remained incarcerated. — Joshua S. Hudson, 28, of Washington C.H., is charged with having weapons under disability, aggravated trafficking in drugs, and possession of a defaced firearm. Hudson was scheduled for a final pretrial hearing Monday, but did not appear. According to Hudson’s defense attorney, Thomas J.C. Arrington, Hudson was scheduled on the same day to appear on charges in Montgomery County at 11 a.m. A warrant for Hudson’s arrest was then issued Monday for failure to appear for the hearing. Arrington said he has not met with Hudson yet and has no idea how his client would like to proceed, and requested a continuance. A continuance was granted. 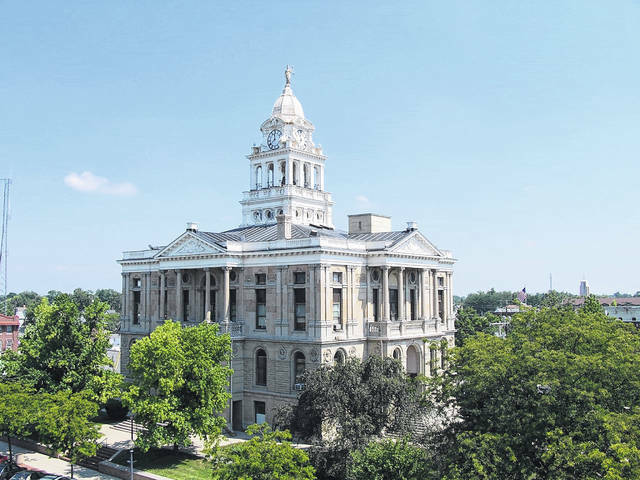 Records from the Montgomery County Court of Common Pleas show the charges against Hudson were dismissed during the hearing Monday. — Desiree D. Coonrod, 23, of Greenfield, was arraigned Monday on charges of aggravated trafficking in drugs and aggravated possession of drugs (bulk methamphetamine) and permitting drug abuse at her 627 Market St. residence. A not guilty plea was entered during the arraignment. Defense attorney Tina Oesterle was appointed as counsel. An informal hearing is scheduled for Dec. 11. — Lisa M. Joseph, 51, of Washington C.H., appeared for arraignment Monday on charges of illegal conveyance of drugs into a detention facility, aggravated possession of drugs, and possession of heroin. A not guilty plea was entered during the arraignment hearing. The court drug screened Joseph in anticipation of a bond hearing and said that she tested positive Monday for benzos, cocaine, meth and ecstasy. Joseph told the court that she has never done ecstasy. The Fayette County Adult Probation Department said ecstasy is in the methamphetamine. Joseph asked to be released from jail to attend her sister’s funeral viewing Tuesday and funeral Wednesday. Judge Beathard said the court would take that under advisement. As of Thursday, Joseph was still incarcerated in the Fayette County Jail with a $10,000 cash-only bond. — Shaniel E. Shapley, 38, was sentenced to probation Nov. 27 after pleading guilty to aggravated possession of drugs, a fifth-degree felony. Shapley, of Washington C.H., was ordered to be supervised for two years by the Fayette County Adult Probation Department. Shapley was ordered to go to Fayette Recovery and to be assessed for treatment of drug abuse. The Washington Police Department arrested Shapley June 4 for an outstanding warrant, according to the Fayette County Prosecutor’s Office, and she consented to a search. The police located a small baggy with meth inside Shapley’s purse. — William Z. Wolfe, 24, of Washington C.H., appeared for a hearing Nov. 27 and told the court that he expects to enter a guilty plea and serve a penitentiary sentence following a plea hearing scheduled for Dec. 11 on a charge of aggravated possession of drugs, a fifth-degree felony. — Cole W. Hagler, 21, of Washington C.H., was sentenced Nov. 27 to 180 days in the Monday Correctional Facility and two years of probationary community control after pleading guilty to aggravated possession of drugs, a fifth-degree felony. — Cody A. Kurtz, 27, of Washington C.H., plead guilty Nov. 27 to passing bad checks, a fourth-degree felony. Kurtz will appear for a sentencing hearing Dec. 11. — Clayton J. Shoults, 37, of Washington C.H., was arraigned Nov. 27 in Fayette County on charges of trafficking and possession of cocaine and marijuana. A not guilty plea was entered on the charges, Oesterle was appointed as counsel, and a hearing was scheduled for Dec. 27. — Timothy Brown, 25, of Washington C.H., is charged with receiving stolen property and misuse of a credit card, and was arraigned on the charges Nov. 27. A not guilty plea was entered.